It was Ruth Palmer’s wish to couple Bach’s Sonata in C major with nothing but the Partita in E major. A perfect length for an LP, but too short for a CD. That was when the idea was born to produce this programme as a purely analogue Direct-to-Disc recording. 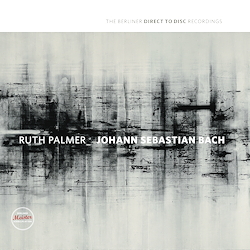 Ruth Palmer’s Bach recordings are like an excursion on many levels. They testify to power, a lust for life and a deep understanding and engagement with Bach. With over 27 minutes playing time on the A-side, we have here what is probably one of the longest Direct-to-Disc LPs in recording history.